Our desire is to have a flow chart that is simple, memorable, and relates to who we are. We have designed a concept based in part on Rick Warren’s five purposes of the New Testament church found in Acts 2:42-47, and in part on our name identity. God gave me this idea January 31, 2003 when I was in the hospital with our baby Brooke at Detroit’s Bon Secours Hospital. It is based on an apple paradigm. When an apple is cut in half horizontally, a cross section looks like what you see to the left. Our desire as a church fellowship is to produce “fruit that will last.” (John 15:16) The problem is, churches don’t produce over the long haul unless they reproduce themselves in the lives of others. If you think about an apple, people love eating the fruit of the apple, but typically throw the core away. The core is critical, however, if more apples are to be made! Just one of the many seeds in the core of a single apple can produce a tree that will yield thousands of apples over that tree’s lifetime. That seed needs to be planted and nurtured, however. It’s no different in churches. People love being fed, and eating the fruit. Getting to the core, or point of reproduction, isn’t as attractive, however. 1) The skin of the apple is paper-thin and not a true indicator of the fruit inside. In fact, the skin has little nutritional value. Nevertheless, people do not want to bite into an apple that has marred/bruised/damaged skin. Our churches are like that. We need to be polished on the things we do. We need to apply a standard of excellence and quality in our people skills and print (brochures, flyers, emails, website, signage, etc.) or people will never take a bite. Especially in a church plant situation, where there are so few people to start. Guests (not visitors) will make a quick assessment of whether or not they want to associate themselves with our fellowship based on our ‘skin’. It won’t matter if we have good fruit to offer if our exterior isn’t polished and inviting because they will never take a bite! 2) The cross section of an apple reveals five sections or cavities that hold the seeds. These represent the five purposes of the New Testament church. They are Discipleship, Worship, Fellowship, Outreach/Evangelism, and Service/Ministry. 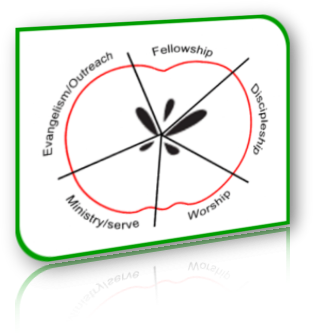 Just as people bite into an apple at a random point, people will bite into our ministry at any one of the above five areas. If they like what they taste, they will continue to taste and partake of the other areas. The ultimate goal is to get people to eat their way to the core and then reproduce themselves in these ministry areas and the lives of others! I have bought into Rick Warren’s conclusion that church growth is not the primary objective. Church health is the primary objective. If we are healthy and balanced in the five purposes of the church, and keep our eyes on Jesus, it will be impossible not to grow!